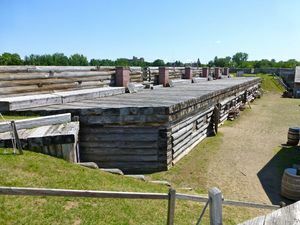 Fort Stanwix (1758-1828) - A colonial fort first established in 1758 during the French & Indian War by British General John Stanwix in Oneida County, New York. Named after British General John Stanwix. Abandoned in 1828. Fort Stanwix was sited to protect the strategic one-mile portage between the Mohawk River and Wood Creek called the "Oneida Carrying Place". Construction began 26 Aug 1758 and was not completed until about 1762. The fort was large and expensive for the day. The perimeter measured 1,450 feet and included four bastions, one at each corner. The walls were 17 feet high built of 2 foot squared logs. A forty foot wide by fourteen foot deep dry moat surrounded the walls. The cost has been estimated to be $266,000, a very large sum for the day. The fort fell into disrepair after the British conquered Canada in 1760. Shortly after the Treaty of Paris that put an end to the war, the treaty of Fort Stanwix (November 5, 1768) was signed with the Iroquois Confederation, by which the Iroquois ceded a large portion of their lands to the British. 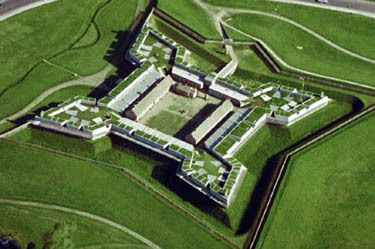 The fort was occupied by American forces in 1776, rebuilt and renamed Fort Schuyler (2). In 1777 British forces under General Barry St. Leger besieged the fort. American militia and their Indian allies under General Nicholas Herkimer came to the aid of Fort Stanwix but were ambushed and turned back at the Battle of Oriskany, one of the bloodiest engagements of the war. Herkimer later died from a leg wound received in the battle. General Benedict Arnold mounted a second relief column from Camp Van Schaick at Albany and St. Leger withdrew from Fort Stanwix. Both these battles were part of St Leger's attempted drive to meet up with General John Burgoyne who was later defeated at Saratoga. The fort remained garrisoned until it burned to the ground in 1781. It was substantially rebuilt and the name changed back to the original Fort Stanwix. 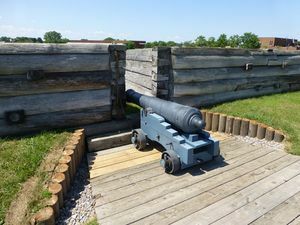 By the start of the War of 1812 the fort had been seriously neglected and an emergency blockhouse was erected on the parade. Starting in 1828 the fort was dismantled. Must See! 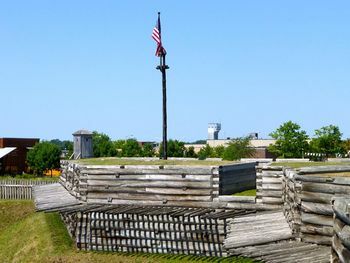 Part of Fort Stanwix National Monument, reconstructed to its 1777 appearance. Location: Rome, Oneida County, New York. This page was last modified 09:47, 12 April 2019 by John Stanton. Based on work by Bill Thayer.